Nile Ranger has spoken for the first time since going AWOL from Bloomfield Road to say Blackpool ‘took the Mick’ with his contract. 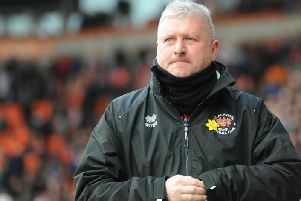 The striker hasn’t reported to training since the start of December with boss Lee Clark claiming he didn’t know where the controversial player was. Ranger played 14 times for the Seasiders this season, scoring two goals before deciding to leave the club and return to London. And after being left out of the squad for the clash against Birmingham at the start of December, Ranger decided enough was enough. “I’m not on a lot of money there to be honest, they really took the mick,” he explained in an interview on YouTube channel Straight No Chaser. “They put me on minimum wage and pay as you play. “I was supposed to go to Leeds but it fell through so I went to Blackpool as a platform and just took whatever deal. “I wasn’t getting in squads and I was asking how am I supposed to fill my fridge if I’m not playing? “I thought I should have been playing. People who don’t know the situation will be thinking, ‘oh, he’s AWOL again’. “There are certain situations going on which no-one knows about. It just didn’t work out. “With the manager and stuff things just weren’t clicking. Ranger’s career has been blighted by a number of high profile issues which has seen his contract terminated at both of his previous two clubs. And after signing for a struggling Blackpool side, the 24-year-old former Newcastle forward admits he had problems. The Seasiders have the option to extend his contract for another year, something which is unlikely given his relationship with manager Clark. But the Londoner now feels he will be back in the game. “I want to start a fresh again next season,” he said. “There will be plenty of opportunities for me, people think my chances have run out.